Image courtesy of Sherman & ShermanA Liberian lawyer who heads the country's ruling party was arrested Wednesday for allegedly paying bribes on behalf of a UK-listed mining company once chaired by former England cricket star Phil Edmonds. Families in Liberia are reportedly bribing retrieval teams to let them keep their loved ones' bodies and give them traditional burials. The current Ebola outbreak has now infected at least 1,975 people and claimed more than 1,000 lives, prompting the World Health Organization (WHO) to declare an International Public Health Emergency. The new film, 'The Ambassador,' recommended on the FCPA Blog and praised by 80% of the top film critics, is a gripping documentary about a kleptocracy and con artists. We've never heard of an African head of state asking the U.S. to deny visas to individuals suspected of corruption. Until now, that is. It happened on Friday when Liberia's president, Ellen Johnson Sirleaf (left), "pleaded with the Government of the United States of America not to give U.S. visas or provide safe havens for Liberians who commit fraud and other acts of corruption in Liberia." Her request came during the groundbreaking for the new U.S. embassy in Monrovia. There's a report from AllAfrica.com here and another on the president's own snazzy website here. For the record, the U.S. State Department is authorized to deny visas to foreign kleptocrats and their families through Presidential Proclamation 7750. See our post Proclamation 7750 Unwrapped. President Johnson Sirleaf -- or "Ellen," as the African headline writers like to call her -- probably angered a lot of corrupt officials in Liberia and across the African continent with her remarks. She does that a lot. Which is why she went to jail once and was forced into exile several times. But as a champion of the rule of law and an anti-corruption crusader, she's never wavered. Now 71, the one-time Citibanker became Liberia's minister of finance in 1979. After a military coup in 1980, she served as president of the Liberian Bank for Development and Investment and was an initial member of the World Bank's Council of African Advisors. In 1985, her bio says, she ran for the Liberian senate. But speaking out against the Samuel Doe regime resulted first in house arrest and eventually in a ten-year jail sentence. After a few months in prison she managed to flee to the U.S. She was then appointed to the U.N. as an Assistant Secretary General. In 1997, she returned to Liberia to run for president, finishing second in a field of thirteen. In 2003, after Charles Taylor was sent into exile, the transitional government appointed Johnson Sirleaf to chair the country's anti-corruption agency. Then in 2005, she won the presidency. Since her inaguration in January 2006, she's been working to restore the rule of law and rebuild confidence at home and abroad. America's decision to build a new embassy there is one sign she's succeeding. 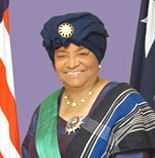 Johnson Sirleaf holds a masters in public administration from Harvard's Kennedy School. Two years ago in Washington, after she spoke to a joint session of Congress, she was awarded the Presidential Medal of Freedom "in recognition for her tireless efforts to make Liberia a post-conflict success story." Farrell, who sports a handlebar mustache and goatee, has some major credibility issues. For one, in 2003 he pled guilty to one count of violating the FCPA and to another count of conspiring to violate the FCPA. . . . But Farrell stood up to the pressure [of cross examination] pretty well. He seemed to connect with the jury, often looking directly at jurors. "Sir, I went into the discussions with the government knowing that I had to tell the truth about what happened," Farrell said at one point. "I didn't think I had to point fingers." Farrell is facing a maximum of ten years in prison but said he's hoping for probation. "I have absolutely no control of that nor does the government," he testified. Read all our posts about U.S. v. Kozeny and the prosecution of Frederic Bourke here. It may seem to Liberians as though everyone in their civil service is corrupt, but it's not true. There's at least one honest man. He's Richard Karyea, a former customs officer at the Roberts International Airport. Two years ago he refused a bribe from a drug smuggler worth more than 1,300 times his $15 monthly salary. He was offered a $20,000 bribe by the owner of a DVD after finding cocaine hidden inside. Instead of looking the other way, he turned the man over to the police. For his trouble, Karyea was fired by the customs department; the drug smuggler was allowed to board another plane that day for Nigeria. But there's a happy ending. In January, Liberia's president, Ellen Johnson Sirleaf, who has vowed to fight public corruption, pinned a medal on Karyea. At a ceremony in Monrovia (pictured above), she named him the Civil Servant of the Year. He won a $1,000 cash award and landed a new job -- Deputy Chief Examiner at the Ministry of Finance. And he's become a national hero. Comments to the Liberia Post said some people might consider him stupid for turning down the huge bribe, but he actually deserves to be a minister in the government. "You are a mentor for all [civil servants] to learn from. Bravo." Liberians needed some good news. Last year, their country ranked 138th on Transparency International's Corruption Perception Index, tied with Paraguay and Tonga. That sounds awful, but its better than 2007, when the country ranked 150th on the CPI, tied with Azerbaijan, Belarus, the Congo, Cote d'Ivoire, Kazakhstan, Kenya, Kyrgyzstan, Sierra Leone, Tajikistan and Zimbabwe. That's a tough neighborhood no one would be sorry to leave behind. At Karyea's award ceremony, President Sirleaf said he demonstrated "honesty and integrity in support of the Government’s determination to fight corruption in all sectors." For his part, the new hero told the BBC, "It wasn't difficult to turn down the money. If it took me 50 years to earn that money, I'd want my conscience. I will always want my conscience." A member of a Spokane, Washington–based diploma mill syndicate who bribed foreign officials to obtain accreditation of phony schools escaped prison in return for his cooperation with prosecutors. According to reports, Richard John Novak, 58, who pleaded guilty in 2006 to one count of violating the Foreign Corrupt Practices Act and another count of conspiring to violate the FCPA and commit wire and mail fraud, was placed on three years probation and ordered to perform 300 hours of community service. He had faced up to ten years in prison. Two other members of the syndicate were sentenced with Novak to probation for conspiracy to commit wire and mail fraud. Other gang members had already been jailed on non-FCPA charges. Steven Karl Randock, Sr., 69, and his wife, Dixie Ellen Randock, were each sentenced to 36 months in prison followed by 3 years of court supervision; Dixie Randock's daughter, Heidi Kae Lorhan, was sentenced to 12 months and one day in prison followed by 2 years of court supervision; and Roberta Markishtum was sentenced to 4 months in prison followed by 1 year of court supervision. They had pleaded guilty to charges of conspiracy to commit wire and mail fraud and money laundering. From 1999 to 2005, the group collected as much as $8 million selling fraudulent academic credentials to over nine thousand individuals located in the United States and elsewhere, the Justice Department said. According to earlier reports, at least 135 U.S. federal employees -- including a White House staff member and National Security Agency employees -- bought bogus college degrees through the gang. The government refused to publicly name any federal employees holding phony degrees. In his plea agreement, Novak admitted paying more than $43,000 to several Liberian government officials to obtain accreditation from Liberia for Saint Regis University, Robertstown University, and James Monroe University. The bribes were also meant to induce Liberian officials to issue letters and other documents to third parties falsely representing that Saint Regis University was properly accredited by Liberia. According to his plea agreement, between October 2002 and September 2004, more than $19,000 was wired from an account in the State of Washington controlled by Dixie and Steven Randock to a bank account in Maryland in the name of the Liberian Consul. Novak was paid $60,000 for helping the Randocks deal with the foreign government officials. The Secret Service filmed a Liberian diplomat taking a bribe from Novak in a hotel room in Washington, D.C. Novak also made cash payments to diplomats in Liberia and Ghana. Of the 6,000 phony college degrees sold by the gang from schools accredited by Liberia, about 40 percent were bought by foreign residents seeking entry into the United States, the government said. The Seattle Times reported in 2006 that Novak attended Spokane Community College for one year. He left without a degree and then worked as a car salesman. But after joining the Randocks' operation in 2002, he was shown on the Saint Regis University web site as holding doctorates in international business, educational administration and psychology. The gang created more than 100 phony schools such as: Saint Regis University; James Monroe University; Robertstown University; Holy Acclaim University; Ameritech University; Fort Young University; Pan America University; All Saints American University; American Capital University; Blackstone University; Capital America University; Hampton Bay University; Hartland University; Intech University; Nation State University; New Manhattan University and Graduate Institute; North United University; Port Rhode University; St. Lourdes University; Saint Renoir University; Stanley State Graduate University; Van Ives University; West American University; International MBA Institute; Apollo Certification Institute; James Monroe High School; Liberty Academy Preparatory High School; Trinity Christian High School; Mission College Preparatory High School; and Bradford Academy College Preparatory High School. 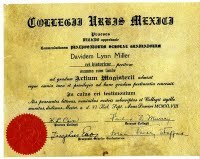 The syndicate also sold counterfeit diplomas and academic products purporting to be from legitimate academic institutions, such as the University of Maryland, George Washington University, Missouri University, and Texas A&M University. View the DOJ's August 05, 2008 release here.